Over the years, there have been numerous anti-smoking campaigns designed to combat the ever-growing tobacco epidemic, some of which have been immensely hard-hitting featuring graphic images and an equally heart-wrenching message. While there have been some advances in technology to provide smokers and those around them with a healthier substitute, like electronic cigarettes and nicotine infused and non-nicotine eliquid, there is still a cause for concern. In today’s post, we will be taking a look at just 4 hard-hitting adverts. She concludes by saying, “If looking at mouth cancer on your cigarettes makes you uncomfortable, look at another part of the pack.” The advert then switches to the Quitline symbol which is located on the graphic image. Not only is this advert shocking, it is also hard-hitting for its audience because of the way they have demonstrated the risk of smoking. For example, smokers often choose to ignore the warnings that appear on the packet in the form of graphic images and text however, putting risks like mouth cancer on a real person helps us to put the risk into perspective and realise how it can affect individuals and ourselves. This next advert consists of a little boy and his mum walking through what appears to be a busy train station when his mum suddenly disappears. The little boy is left crying in the station looking for his mum however; it isn’t until the advert concludes that we know what it’s about. This leaves our minds open to perspective and helps to churn several emotions. The advert concludes with the words, “If this is how your child feels after losing you for a minute, just imagine if they lost you for life.” This advert is clever as it lets us see things from a different point of view; many adverts focus on the specific health risks involved or the smokers point of view however, this advert shows us how a smoker’s act can affect others. The thing that makes it so hard-hitting is that they’ve used a young child’s point of view, someone who is often associated with innocence and, in a way, could inflict emotions such as guilt on the viewer. This advert brings to light the cancer risks associated with smoking in a graphic and upfront way. The advert begins with a man outside smoking and every time he takes a drag a bodily mutation grows bigger on the unsmoked areas of his cigarette. As the advert goes on, it is narrated by a voice that explains how smoking causes mutations and how “mutations are how cancer starts.” This approach is incredibly hard-hitting as it uses research and graphic images to show you just how much harm you’re actually causing your body. Unlike the others mentioned in this article, this particular ad isn’t a video; however, it is equally effective in getting its message across. 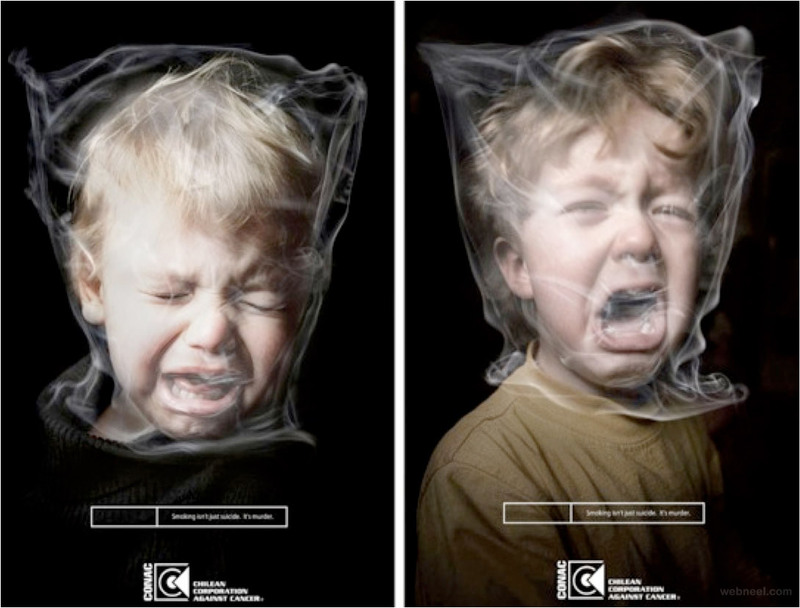 Similar to the ‘scared little boy’ ad in terms of focusing on a different point of view, this ad also uses children to express the damage that smoking can cause. As you can see by clicking on the link provided, there are two crying boys with a plastic bag-like shape wrapped around their heads in the form of smoke. This advert is meant to show that second-hand smoke is just as damaging and harmful as having a cigarette, if not more and the second-hand smoke you’re exposing your children suffocates them and their lungs, causing a great amount of damage to their internal organs in their early years. This advert is powerful as it focuses on a person that many parents hold close to home and again, there’s the play on the idea of innocence featured in this ad. These are just 4 hard-hitting anti-smoking adverts. Do you have any more that you’d like to add to the list?